The health benefits of bee pollen are plentiful. Heck, even Hippocrates stated bee pollen contained the secret against old age and from what I understand he was a pretty smart guy. So perhaps it’s worth reading a bit further. Before moving on though, I will warn you - there is a lot of hype out there surrounding bee pollen. Just enter it into Google and you'll find dozens and dozens of supposed 'miracle cures' attributed to nothing but someone's pollen use. 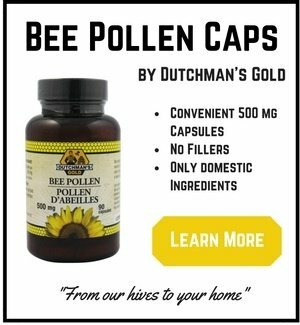 I worked in my parents honey shop from the time I could walk and heard and saw hundreds of testimonials on the power and benefits of bee pollen. But I never saw it 'cure cancer' or 'increase endurance by 50%' like some web sites claim. I did however see people with cancer use it as part of a comprehensive holistic health approach to their treatment and get well. And I did see athletes achieve amazing results using bee pollen as one tool in their nutritional arsenal. So just remember, there is NO ONE supplement that will 'do it all', like some marketers claim. And while I'd vote for bee pollen if I had to pick the closest thing to a 'do it all' supplement, remember that attaining perfect health will likely involve eating many healthy foods and taking many healthy supplements. By the way, I'm currently putting bee pollen to "the allergy test" with my husband Mark, a long time allergy sufferer. Read his results here. And here is an excerpt from my mother Annie's web site. She’s been working with bee pollen and royal jelly for over 28 years now and travels around the world learning and teaching the science of apitherapy (the science of using bee products for health). I can honestly say she has seen and heard it all when it comes to bees and the benefits of bee pollen. "Bee Pollen has been known to help speed up the healing process, revitalize the body's many systems and assist in protecting cells in our bodies from free radical damage - a major cause of cancer. It helps to improve unhealthy and/or aging skin, clear acne, age spots and plump wrinkles." "It helps those who bruise easily, due to its rutin content which helps build strength in the capillary walls, helps strengthen the heart, helps fightanemia, and helps regulate high blood pressure by regulating blood flow. A number of athletes use it to help increase their endurance and strength as well as a natural weight control." "Rich in lecithin, bee pollen helps speed up calorie burning and stabilize faulty metabolism, and helps benefit digestion. 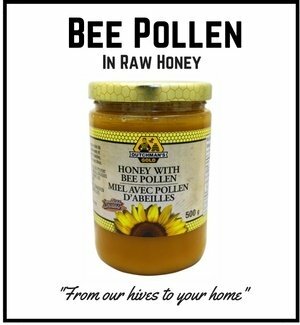 Bee Pollen targets the entire body, but gives a special boost to reproductive, immune and nervous systems. It has antibiotic, astringent, relaxant, tonic, and nutritive properties. It helps to correct and stabilize our body chemistry." So How Does it Provide All of These Benefits? To the uneducated, the man bee pollen benefits really seems to good to be true. Bee pollen helps so many people because it contains over a dozen vitamins, 28 minerals, 11 enzymes and co-enzymes, and 14 fatty acids. It's impossible to make numbers like that up. Science has validated these facts for us. When you combine this most nutrient dense food (possibly on the planet) with the massive nutrient deficiencies facing the Western world, you tend to get the amazing results and testimonials we get at Dutchmans Gold and here. It is a fact that our food has lost greater than 50% of its vitamin and mineral content since 1950. And that's fresh, unprocessed food. As soon as you heat, cook, fry, microwave, process or irradiate a food, the percentage goes down further. So to say that we are malnourished would be an understatement. Those that use bee pollen and experience tremendous results are likely experiencing the correction of many nutrient deficiencies. So do yourself a favor and try a tablespoon a day for a month.